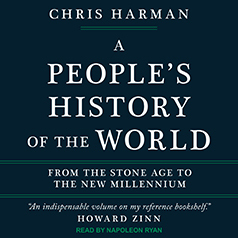 Chris Harman describes the shape and course of human history as a narrative of ordinary people forming and re-forming complex societies in pursuit of common human goals. Interacting with the forces of technological change as well as the impact of powerful individuals and revolutionary ideas, these societies have engendered events familiar to every schoolchild—from the empires of antiquity to the world wars of the twentieth century. In a bravura conclusion, Chris Harman exposes the reductive complacency of contemporary capitalism, and asks, in a world riven as never before by suffering and inequality, why we imagine that it can—or should—survive much longer. Ambitious, provocative and invigorating, A People's History of the World delivers a vital corrective to traditional history, as well as a powerful sense of the deep currents of humanity which surge beneath the froth of government.